Jasmine family hostel is brand newly built with greenery garden and pool view in quiet place just off from main road in the center of siem reap town like angkor boutique hostel.Jasmine family hostel has swimming pool for relax from a long day temples and atmosphere with trees and flowers around hostel with nice breeze in air with cool beers. 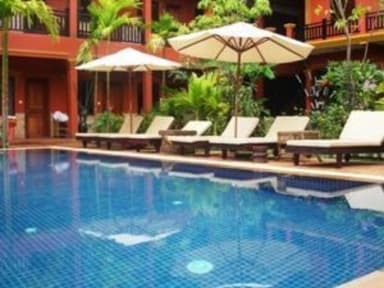 I really enjoyed my stay at Jasmine family hostel! The staff is friendly, the facilities are clean and the breakfast is great! Nice place to stay with a a good breakfast. Very nice pool. Clean rooms. The only negative I have is that the staff say breakfast starts at 6:30. So the morning of our visit to Angkor way we were counting on that and no one showed up until 7. That might of been a one time mistake but it’s worth noting. I love this place actually but it’s a little far from town but you can walk if you have time but i don’t mind because tuk tuk really cheap! Our stay at Jasmine guesthouse was very pleasant. Accommodations were very good - all in working order, clean and no surprises. Nice pool area. Compared to the Jasmine lodge, the guesthouse lacks street noise. Gratis breakfast was good and filling. Staff are friendly. Neighborhood is away from the party scene with plenty of eating options just south off the main road. 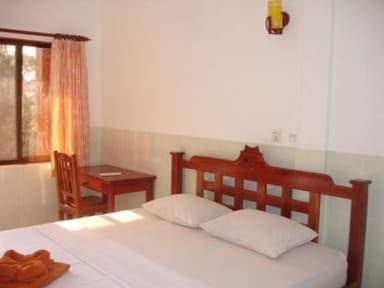 You will see more chinese options and translations of menus here than other areas of Sien Reap. I stayed one night and they asked me to prepay the $150 for the 5 nights we had a reservation. My mother had a stroke that night, not their fault, but we left early to the hospital. When I returned early the next afternoon I asked for a refund for the unused nights. Nope. No help, no compassion, only refunded 1 1/2 nights ($45) which is against their own 48 hour cancellation policy. Heartless people. DO NOT STAY AT THIS HOSTEL. If you do it you take the risk of having a bad experience as I did. They literally don't attend emails so it's possible that when you get there the say there is no booking. That is what happened to me and three other groups as I witnessed in less than 48h. Most time the reception desk is covered with housekeepers who are clearly unskilled and speak no English. On the top of all this, the premises aren't as good as shown in pictures. Don't risk stay somewhere else. Booked a reservation a few days in advance. We arrived at the hotel and we're told that the rooms were full and we couldn't have a room. Even though we had paid a deposit and reserved a room. The frustrating thing was the hotels lack of care. Mistakes happen but nothing was done to help us out. They refused to pay for a tuk tuk to the new accommodation which we luckily found and made no attempt to even apologise. DON'T STAY! We witnessed it happen to 4 other groups the same day!! After paying the deposit on Hostelworld, we got to Jasmine Family Hostel only for the (nice but fairly useless) guy behind the desk to tell me they had no record of our booking and no room available. Part of me is glad though as we both got an unpleasant feeling about the place whilst waiting in reception.